Don't forget that the museums and galleries here in Singapore have a free open day to celebrate Hari Raya Puasa, which falls on Sunday 20th September this year. The Philatelic Museum have some interesting activities for kids and adults lined up, including a quiz about the exhibition, craft activities ($3 registration, call Jonna on 6337 3888/6513 7348), free guided tours (11am-12noon and 3pm-4pm), and of course the exhibition itself, "From Vintage to Grand Prix". This ties in with the Singapore F1 race in a few weeks and includes a display of some 400 limited edition model cars. Kids can then have fun racing toy cars down the museum's racetrack. For more details go to the Philatelic Museum website. 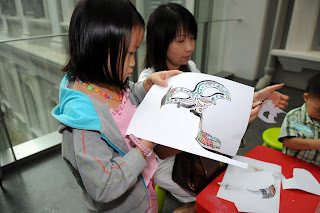 The Singapore Art Museum also has an open day with a full day's activities for kids at the I Heart Art: Kids Carnival. Workshops include painting, drawing, etching, printmaking, sculpting and clay modelling. For a fee of $5 can get creative and make their own pizza with the museum's resident chef. The most creative pizza stands to win a prize. There will also be Buffet Raya, with stalls of pre-loved accessories and other items in the carpark, and other activities. For all the details, go to the SAM website. The Istana is also well worth visiting, as it is only open a few times a year, Hari Raya Puasa being one such day. Admission to the Istana grounds is free for Singaporeans and Singapore Permanent Residents. Others, including foreign visitors, must pay an entrance fee of $1 per person. Entrance to the grounds is via the main gate at Orchard Road. Opening hours are usually from 8.30 am to 6.00 pm. For an extra entrance fee of $2, members of the public are allowed to view the Staterooms in the Istana Building. Other National Heritage Board Museums with free open days are the National Museum of Singapore, Asian Civilisation Museum, Reflections at Bukit Chandu, Memories at Old Ford Factory. Other National Heritage Board Museums with free open days on 29th September are National Museum of Singapore, Asian Civilisation Museum, Reflections at Bukit Chandu, Memories at Old Ford Factory. 71 Bras Basah Road, Singapore 189555. Great info! I also think I noticed on a banner that there would be 150 weddings in Botanic Gardens on the 20th. Did I read this correctly? Do you know anything about it?